An invitation to major league camp provides different experiences for different young players. For right-hander Allen Webster, the experience taught him how important it was to be consistent every time you’re handed the ball. 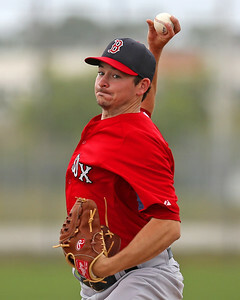 Webster’s Pawtucket teammate, catcher Dan Butler, got the chance to catch seasoned major-league arms. And for Butler, there’s not much separating the pitchers who will break camp with Boston from Webster, the recently-acquired crown jewel of the Red Sox’ cache of upper-level pitching prospects. As Webster, who was sent down to minor league camp on March 15, readjusts to what could be his last year in minor-league ball, he continued to show the same repertoire that impressed in big-league camp on Saturday in a Triple-A game against the Minnesota Twins. Webster worked a 1-2-3 first inning, and reached back to throw a handful of 96 mph fastballs while mixing in his changeup and slider. In the second inning, Webster ran into mechanical problems and allowed a leadoff home run to Twins outfield prospect Oswaldo Arcia. From there, Webster struggled to repeat his delivery, seemingly alternating between stretches of staying too upright through his delivery and leaving the ball up in the strike zone, and sequences where he’d rush his motion and leave everything in the dirt. He threw 31 pitches in the frame and did not retire a batter, though the relaxed spring training rules allowed the coaches to end the inning. But with a clean slate in the third inning, Webster found his delivery and effectively mixed his pitches. From that point until Webster departed in the fifth inning, he showcased his secondary pitches. Webster throws both a hard slider at 84-86 mph, and a slurvy mid-70s breaking ball that has been in and out of his repertoire throughout his minor-league career. By using the changeup and his plus slider in all counts, Butler said Webster’s fastball plays up. “He’s got good secondary stuff, and that allows his fastball to play a lot higher, makes it look a lot faster, makes it sink a lot harder and it helps his fastball stay in the zone,” Butler said. Webster, the No. 4-ranked player on SoxProspects.com and the second-best pitching prospect behind Matt Barnes, was acquired in the August 2012 mega-deal with the Los Angeles Dodgers. Webster boasted a 3.55 ERA and just under a strikeout per inning with Double-A Chattanooga before the deal, and made two starts with Portland after the trade.